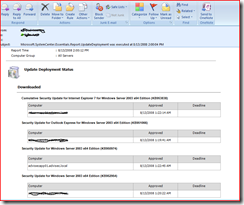 Would you like to be able to schedule reports in SCE? Have you ever wanted to get a report sent by mail or saved to a file share on a schedule basis? In System Center Operations Manager, you have this function directly in the System Center Operations Manager Console but for System Center Essentials, this feature was not included (because the limitation in SQL Express that is included in Essentials 2007). So – how can we fix this? 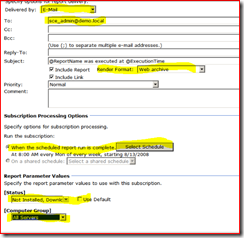 Since Essentials use SQL 2005 Reporting engine, we can configure this from the Report Manager (Note that this will not work if you use SQL 2005 Express or SQL 2005 Workgroup since they don’t have this feature). 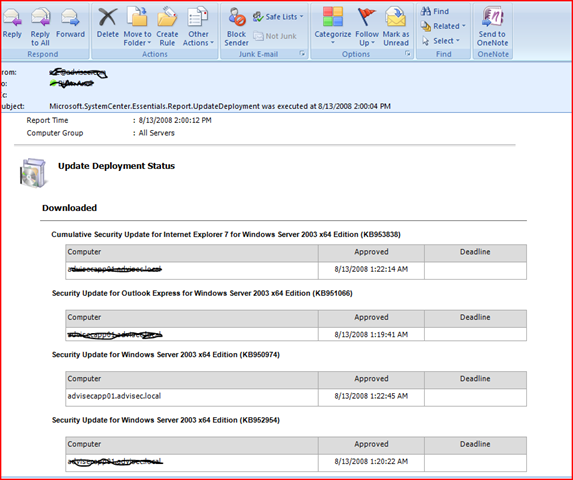 The example below we will configure so you get the Update Deployment report in your inbox every morning. Note that this is just an example, you can schedule every report available in Essentials. 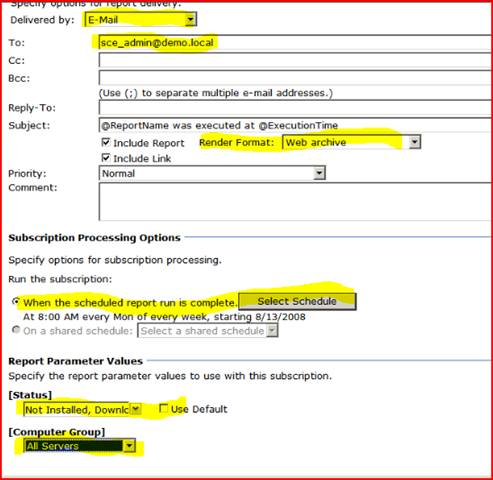 First we need to verify that the Reporting server is configured to send report via mail. Delivered by = E-mail (if e-mail is not available to select, you have missed the first 4 steps). Note! If you add a “external” e-mail address you need to make sure the reporting server are permitted to “relay” mail traffic.